It’s a fascinating tale: Miners — most from Mexico but also from Europe and South America — came to the New Almaden mines, where they blasted chunks of cinnabar ore and distilled the “quicksilver,” essential for prospectors seeking gold and doctors taking children’s temperatures. They held contests to prove who could pound a spike the deepest into a granite slab. From 1845 to 1976, seven New Almaden mines produced nearly 84 million pounds of mercury, Taich’s brochure notes. It was the second-most productive mercury mining operation in the world. It wasn’t all progress: Mercury contamination makes it unsafe to eat any fish caught in the Guadalupe Reservoir at the park. Taich latched onto the story of Almaden Quicksilver’s mines because he needed a public service project to become an Eagle Scout before he turned 18 last December. When his first idea, a clothing drive at his synagogue, didn’t pan out, he turned to Malone – who has written books on the history of Silicon Valley and the rise of Apple and Hewlett-Packard – for advice. 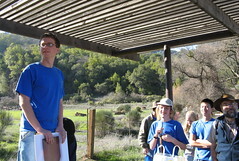 Last summer, Taich, Malone and their fellow Scouts in Troop 466 in Sunnyvale installed 15 numbered redwood posts corresponding to points on Taich’s map. (Copies of the map should be in the slots at the trail board at the park’s Hacienda trail head). Putting the map together meant weeks of back-and-forth with park staff to make sure his words matched the historical record. His sister, Jessica, a sophomore studying graphic design at American University in Washington, D.C., handled the design and layout. Tim Taich, Zack’s dad, general counsel of Activant Solutions, a business software developer, provided moral and financial support. Though lots of people helped out, he says Zack deserves the most credit. There’d also be no project if Malone hadn’t been so fascinated with the patches and medals the Boy Scouts of America award to Scouts who hike historic trails. Designated historic Scouting trails are common throughout the United States but rare in the West, and rarer still in California. Malone found a moribund Scout trail in Monterey, and got busy bringing it back to life. After that, Malone wanted a medal for Scouts who hike a historic trail closer to home. Taich’s call for advice gave him his chance. Taich’s sister designed a medal that will be sold at the Boy Scout Shop in San Jose and the Almaden-Quicksilver Museum to raise money for both organizations. Taich is moving on to planning for college and getting on with his life, but he hopes his guided Almaden Quicksilver tour will have a lasting impact. Rugged climbs and tangled oaks define the hiking experience at Almaden Quicksilver County Park. Standard precautions: Poison oak is common, especially on single-track trails. Old mining roads can be steep and tiring. Keep your distance from ruins of the mining era. Watch for mountain bikers – and mountain lions. Easy: The New Almaden Trail from the Mockingbird Hill Lane entrance takes a nice up-and-down route through the woods for about a half-mile to Randol Creek – you can turn back from there or head uphill. A 2.5-mile out-and-back to the Buena Vista Mine site is a bit more rugged, but worth the effort. Moderate: You can’t go wrong on the 6.5-miler in Zack Taich’s history hike. It passes all the must-see mining sites, and has expansive views of the Santa Cruz Mountains. 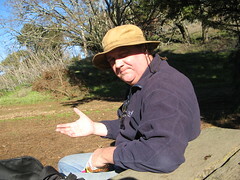 Trail head is at the park’s Hacienda entrance just past the village of New Almaden. Hard: For an all-day trek that’ll have your feet filing formal protests, grab a map at the Hacienda entrance and hike to the Guadalupe Reservoir on the park’s far side, and return. A basic route departing on the Mine Hill Trail and returning on the Randol Trail is about nine miles, but options for ramping up a route to 12 or 15 miles are wide open. Driving directions: Mockingbird Hill entrance: From Highway 85, take the Almaden Expressway exit south 4.5 miles to Almaden Road. Go 0.5 miles on Almaden Road to Mockingbird Hill Lane, turn right and go 0.4 miles to the parking area. Hacienda entrance: From Highway 85, take Almaden Expressway 4.5 miles, and turn right on Almaden Road. Go 3 miles along Almaden Road through the village of New Almaden to the parking area on the right.